description Frankfurther's dramatic lithograph depicting a demonstration in 1950s' Whitechapel shows an artistic response to political events. An anxious crowd of all-female protestors gathers in the foreground, broken up by the entrance of mounted policemen behind them, who sow fear among the crowd. The women call out, purse their lips with disapproval or cross their arms over the heads for protection. Strongly left-wing and highly politically motivated, the artist often attended demonstrations herself, but it is not known whether the scene was observed or imagined. 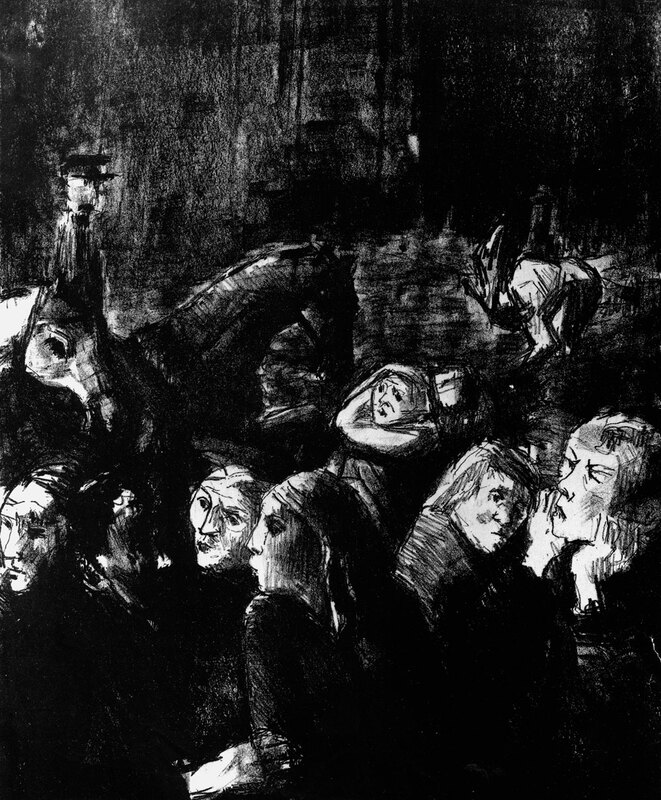 The work has affinities with that of the German realist Kathe Kollwitz, whose work also championed the working class and expressed a similar social conscience to Frankfurther's own. exhibition history Eva Frankfurther 1930-1959: Retrospective Exhibition', Ben Uri Art Gallery, 14 Berners Street, London W1, 14 Feb-9 March 1962, as (49), 'Demonstrators'; 'Eva Frankfurther 1930-59:Memorial Exhibition', Boundary Gallery, London, 15 June-18 July 2001, (81), £280; 'Refiguring the 50s: Joan Eardley, Sheila Fell, Eva Frankfurther, Josef Herman and L S Lowry', Ben Uri Gallery and Museum, 108A Boundary Road, London, NW8 ORH, 14 Nov 2014-22 Feb 2015, (21). literature ed., B. Planskoy, 'Eva Frankfurther 1930-59: Paintings, lithographs and drawings' (London: Peter Halban, 2001), illus., p. 37; ed., S. MacDougall, 'Refiguring the 50s: Joan Eardley, Sheila Fell, Eva Frankfurther, Josef Herman, L S Lowry' (London: Ben Uri Gallery, 2014), p. 33, and illus., frontispiece, and p. 45.